The Kentucky Transportation Cabinet TAMP is available here. The Kentucky Transportation Cabinet TAMP outlines planned road and bridge investments and desired levels of service for the next 10 years. It documents the processes used to develop the required elements of the TAMP and is compliant with federal requirements. 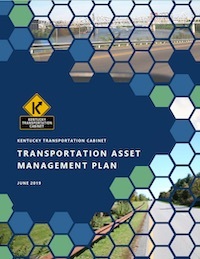 The TAMP provides critical input to Kentucky's existing transportation plans, linking capital and maintenance expenditures to asset conditions. This document includes the following sections: Asset Valuation, Financial Plan, Introduction, Inventory and Condition, Investment Strategies, Lifecycle Management, Objectives and Measures, Performance Assessment, Process Improvements, Regulatory and Legislative Requirements, Risk Management. • Performance/LOS targets are linked to agency goals/objectives. The modal scope of this document is: Highway Only. The asset scope of this document is: Highway Assets, Pavement and bridge only.